OXFORD, Miss. 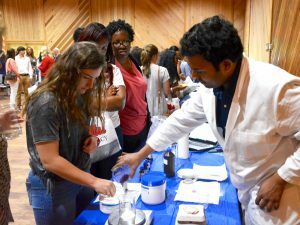 – The University of Mississippi School of Pharmacy will host a pharmacy showcase this spring to educate those interested in health care about the more than 600 career paths available in the field of pharmacy. The pharmacy showcase event, sponsored in part by a Walgreens Diversity Initiative, is designed as a meet-and-greet with the School of Pharmacy’s dean David D. Allen, as well as faculty, staff, current students and pharmacy practitioners from different areas of practice. Attendees at the pharmacy showcase events have a chance to participate in hands-on activities such as compounding lip balm. Attendees may also participate in hands-on activities such as compounding lip balm. High school and college students, parents, alumni and counselors are all welcome to attend. The event will be held April 23 in Starkville at The Mill at MSU from 6-8 p.m. The browse fair is free and will feature free food. To register, visit pharmacy.olemiss.edu/earlyentry. For more information, please email admissions counselors Lindsey Cooper at lindsey@olemiss.edu or 662-915-1323, or Meredith Pyle at mapyle@olemiss.edu or 662-915-2437.